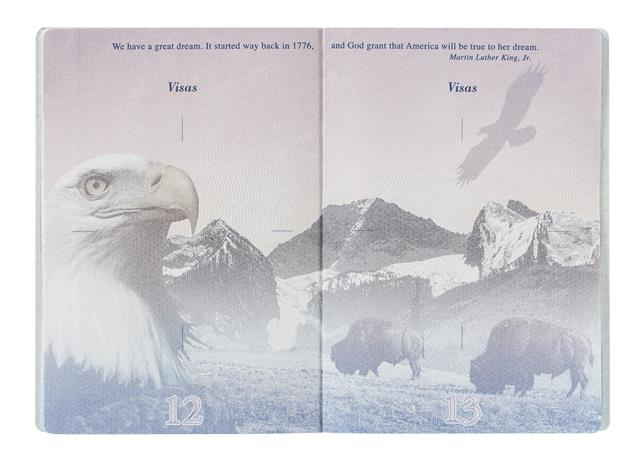 When the U.S. passport was redesigned in 2007, not only was a biometric chip added, but the pages were reimagined. Images were added. Ostensibly to cut down on counterfeits, the dark images have made some stamps difficult to read. Quotes were also added at the top of each page. In a 52-page passport, this included 25 patriotic quotes relating to the United States. Some found these quotes to be overly-jingoistic, but the selection was carefully balanced to include voices across the political spectrum. I compiled every quote and include it below. This is a new nation based on a mighty continent, of boundless possibilities. For this is what America is all about. It is the uncrossed desert and the unclimbed ridge. It is the star that is not reached and the harvest sleeping in the unplowed ground. Is our world gone? We say “Farewell.” Is a new world coming? We welcome it–and we will bend it to the hopes of man. May God continue the unity of our country as the railroad unites the two great oceans of the world. -inscribed on the Golden Spike. Promontory Point, 1869. We send thanks to all the Animal life in the world. They have many things to teach us people. We are glad they are still here and we hope it will always be so. The cause of freedom is not the case of a race or a sect or a party or a class — it is the cause of humankind, the very birthright of humanity. Liberty is never out of bounds or off limits; it spreads wherever it can capture the imagination of men. What a glorious morning for our country. We are covered by the American banner; let us cling to it, and if required, sacrifice our lives defending it. …That this nation. under God, shall have a new birth of freedom. A big iron needle stitching the country together. It is immigrants who brought to this land the skills of their hands and brains to make it a beacon of opportunity and hope for all men. This nation has a banner…it is the banner of Dawn. It means Liberty…Every color means liberty; every thread means liberty. We live in a world that is lit by lightning. So much is changing and will change, but so much endures and transcends time. For the great story behind the last quote, read this. Nice to see someone your age paying attention to this. It give me hope for the future. As much of a mess as things may seem in the US now, we are lucky to be here, at least that is how I feel today. These quotes are absurd, although it was interesting for you to compile them here. I’m frankly embarrassed to use my US passport, because of the hyper-nationalism on display. Luckily my EU passport doesn’t feature quotes from Mussolini and every other hot-headed nationalist that has complicated Europe’s history. Thank you for being the voice of sanity. The inclusion of all these quotes is cringeworthy to say the least. Being a bit dramatic, aren’t we? Embarrassed because it contains quotes from historical figures? Weak, have some more soy. @Anthony, if you are so embarrassed please feel free to turn your US passport into the State Department. I am sure they would be happy to accommodate you. I did exactly that (give my blue passport back) Won’t look back. Today I’m back in Europe, enjoying my freedom to drink a beer in a public space, to have decent health care in between jobs or without millions of dollars. To share a country with compassionate normal people…well, everywhere. Enjoying my freedom to almost certainly not get shot in the head for no reason, well…ever. @Andy – Good on you. Let every nation know, whether it wishes us well or ill, that we shall not pay any price, not bear any burden, not meet any hardship, sell out our friends, agree with any foe, and kowtow to North Korea to assure the survival the Presidency, even if we have a puppet regime. And finally, ask not what you can do for your country. Ask what your country can do for you. Maybe a free cell phone, maybe free city bus fare, maybe even a car? No, don’t use the above quotes. Better yet, not so many pictures which obscure lightly stamped passport stamps. I read my passport while waiting sometimes. Screw the haters and trolls. 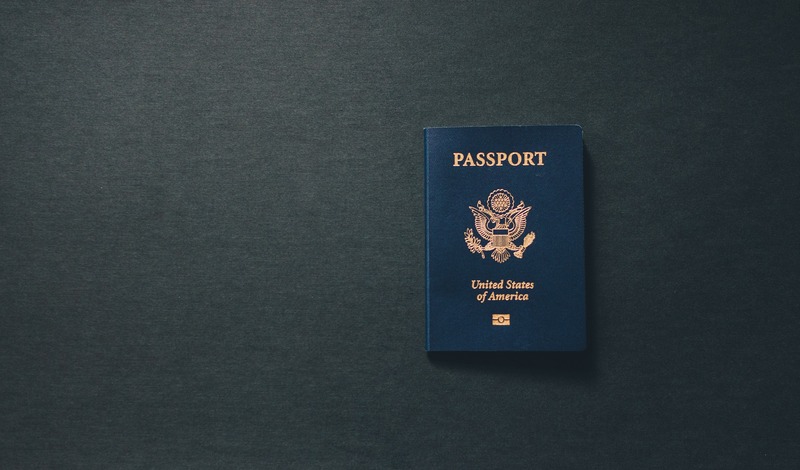 Getting my US Passport was a process that ultimately took me almost 20 years. I sincerely am proud every moment I hold it. I became a US Citizen 30 years ago tomorrow.